Boarding for children in kindergartens include breakfast, lunch, snacks and drinking. But not only the nutritional and sustainable quality of served meals are important for the development of appropriate children´s eating behavior, but also atmosphere in kindergarten, intercultural communication, pedagogical work etc. What is considered to be good and high quality depends on the focus. There are many players for providing and handling with food and drinks in kindergartens, which all have different roles, expectations, wishes and possibilities. In the following illustration typical players around kindergarten-food are shown. They all have different expectations about what means “good food” in the kindergarten. A mutual understanding of these expectations it the first step to optimize food quality and food culture in the kindergarten. Kindergarten staff can be the driving force to create a nutrition team with all relevant players. Ideal account of members is five to eight. In the first meeting of this team, it is helpful to collect and discuss the expectations and objectives of all members. Which image has the food offer/boarding with the respective actors and target groups? Have all players the possibility to express their wishes? 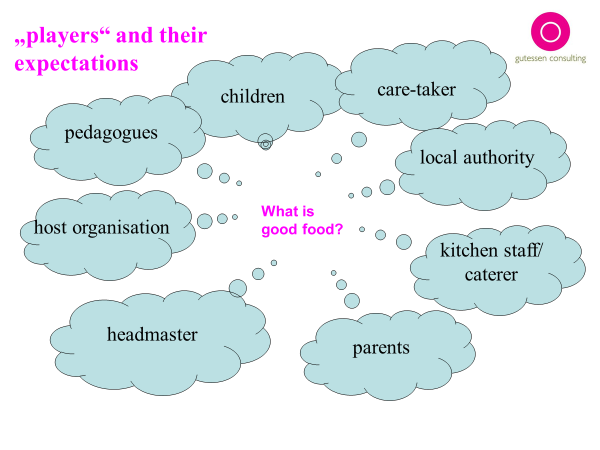 Are meals/food and drink offers integrated into the pedagogical concept?